Fit Metabolism is a science-first approach nutritional behavior management consulting firm which helps their members not only lose weight but also shift their lives into a sustainable healthy lifestyle. For the last decade since they’ve opened their doors, the firm has operated their business using manual processes that required a significant use of paper. Their goal was to bring their business into the digital age by automating not only their current business processes but enabling new opportunities for their lifestyle consultants and their members. 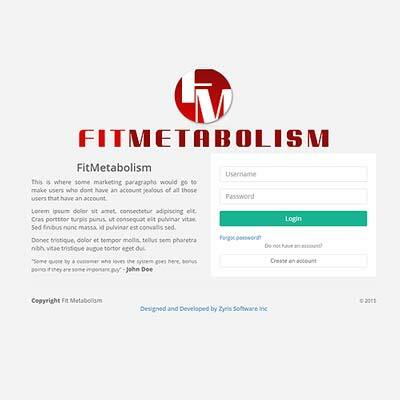 By adopting a new custom paperless web-based customer management system, FitMetabolism has increased its profit margin, decreased its environmental impact, and positioned the company for future growth. Traditionally when Fit Metabolism consultants meet with their weight-loss management customers to identify their needs and perform fitness tests, information tracking and management was performed manually. This process was slow, inaccurate, and inefficient for the company’s growing needs. Additionally, there was also a long and tall learning curve for Fit Metabolism’s weight loss customers since information was always manually recorded. Zyris designed and developed a cloud-based customer information management system that increases Fit Metabolism’s customer consulting process efficiency, enables progress data analytics tracking, and allows members to access their reports to track their weight-loss program progress. The benefits of the cloud-based customer information management system has helped Fit Metabolism address their previous constraints and positioned the company to grow. By using their new paperless database system, the Fit Metabolism management team take on more customers more efficiently, with a higher level of information accuracy while still offering the same level of quality that their members expect. In addition, the company has increased its profit margin by more than 20% while reducing its overall environmental impact by almost 80% as a result of reduced paper and additional supplies such as toner and other stationary throughout the office. We had the pleasure of working with the Zyris team over the past 9-months and have been impressed with the strategic insights, technical ability and candid communication of Zyris Software. Over the 9-month period we designed and developed a powerful web application software which will serve as the foundational platform for our future growth. Zyris was flexible and responsive in meeting both in person and over the phone and made or exceeded all established milestones for our project. I would definitely recommend these guys to anyone looking to build game changing technology that truly represents the value proposition of their business.